Perseverance. Organization. Passion. Commitment. They are the definitions of grass-roots organizing and the descriptive words that tell the story of the formation and continuing efforts of the Minnesota Peace Project. Founded in early 2009, the Minnesota Peace Project’s (MPP) mission is to build a more peaceful world by influencing U.S. foreign policy through the exchange of perspectives and information with Minnesota members of Congress. With volunteer coordinators in each Congressional District and two Senate teams, MPP seeks to develop long-term, respectful relationships between constituent peace advocates and their Congressional representatives and staff members. Sound like a daunting task? 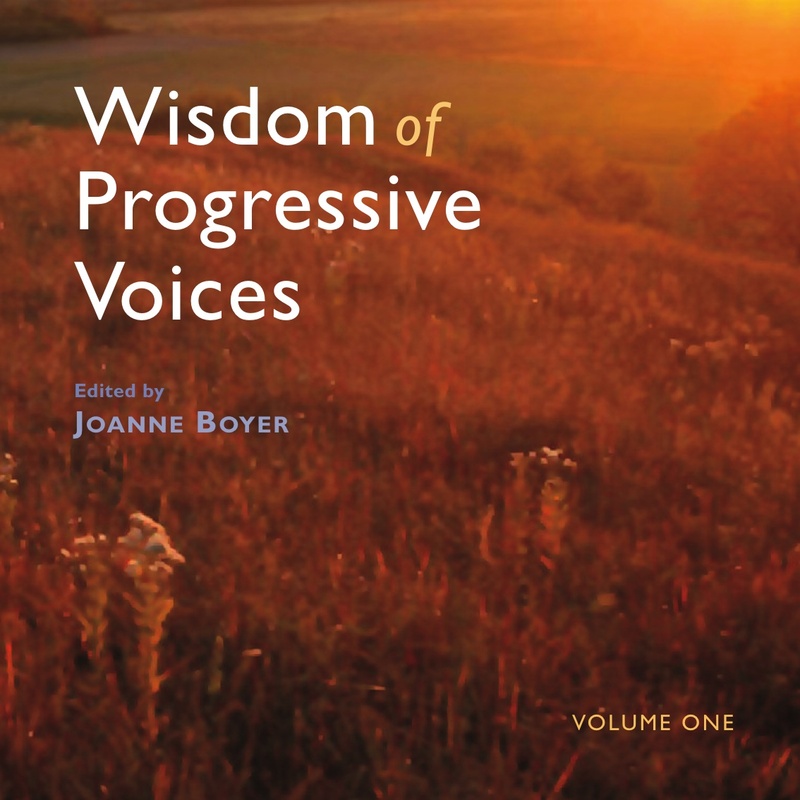 It’s what fuels the day-in and day-out work of both MPP co-founder Roxanne Abbas and Minnesota Third Congressional District Coordinator Linda Thomson, both of whom recently sat down with Wisdom Voices to talk about their work and that of the organization. Minnesota Peace Project co-founder Roxanne Abbas (left) and district coordinator Linda Thomson (far right) with Minnesota Congressman Tim Walz. “I was not active in the peace movement until President (George W.) Bush announced the invasion of Iraq (2003),” Abbas said. “I tell people it was President Bush who recruited me for this intense involvement. I’d worked with other peace groups in the past, but from my perspective none of them was really working effectively to influence their members of Congress. Peace is not a partisan issue. Thomson with her representative, Republican Erik Paulsen. “I’ve been at conventions where I walk into other people’s party rooms and just start talking,” Roxanne laughed. But it’s far more than just talking that has been the real nugget of success for MPP. It is in the art of listening and using the tool of dialogue in which the organization has fine-tuned its work with the Minnesota congressional delegation, which ranges from Progressive Caucus co-chair Keith Ellison (Minnesota 5th District) to staunch Republican Erik Paulsen (Minnesota 3rd District). 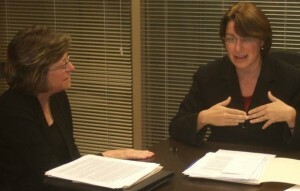 MPP’s Roxanne Abbas with Minnesota Senator Amy Klobuchar. “We continue to try to understand where each member of Congress is coming from,” Thomson added. “We don’t generalize about all 10 (Minnesota) members of Congress (eight representatives and two senators). It’s how to most effectively work with, for example, Senator (Amy) Klobuchar or with (Rep.) John Kline (Republican, Minnesota 2nd District). We’ll look for issues on which we find common ground so we study and share with each other the unique profiles of our members of Congress so when we meet with them in DC, we maximize our effectiveness and improve our chances of making a difference. It is in building relationships, meticulous research on topics, and frequent meetings and phone calls with legislators that produces “victories” for MPP. It is within that framework that brings change from a representative or senator. Both women pointed to the work done with Sen. Klobuchar’s office that helped her to change positions on cluster bombs. Or MPP’s organized efforts from members calling Rep. Paulsen’s office to protest his scheduled AIPAC-sponsored trip to Israel three years ago. “We’re convinced that the calling alerted Paulsen to an interest level in his district that was greater than he thought,” Abbas said. “We tell people we know we’ve made significant changes because action does result from our work,” she continued. “Just look at the opposition to U.S. intervention in Syria. Our efforts joined with others and citizens rose up in high numbers to oppose military intervention. 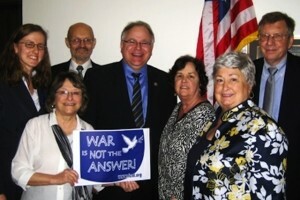 There were peace advocates in Congressman (Tim) Walz’ district that said it was hopeless to get him to oppose a military response. But we recruited a retired Mayo physician and his wife to talk to Walz. At first he was ambivalent; he wasn’t sure in which direction he would go. But we told him (through his staff) that people in his district were war weary and wanted financial resources to go into infrastructure projects here at home. For more information on MPP, their Peace agenda and to contact them directly, please click here. This entry was posted in Democracy, Keith Ellison, Peace, Progressive Profiles and tagged Minnesota Peace Project, peace. Bookmark the permalink.